RoboDK supports all ABB robots that are programmed in RAPID language, including PRG and MOD files (IRC5, S4 and S4C robot controllers). This documentation is based on the IRC5 ABB robot controller. The following sections demonstrate typical operations using an ABB robot teach pendant, for example, to prepare a new robot program in RoboDK and transfer it to the robot. 1. Change the controller switch to manual mode. The “Manual” message at the top menu bar should be displayed. 3. Select the program generated by RoboDK. Depending on the post processor you use, you may already have the Main routine in your module. 4. Hold the “dead man” switch on the teach pendant if you are operating in manual mode. The message Motors On as the status of the robot should be visible as well as the orange robot light should be turned on. 4. Enter the remote FTP path. The complete path can be retrieved from the teach pendant or using FileZilla FTP Client. This will generate the program and attempt to transfer it to the robot controller. A window will pop up showing if the FTP transfer was successful or not. Tip: Download the module to run programs sent through FTP here. Robot drivers provide an alternative to Offline Programming. 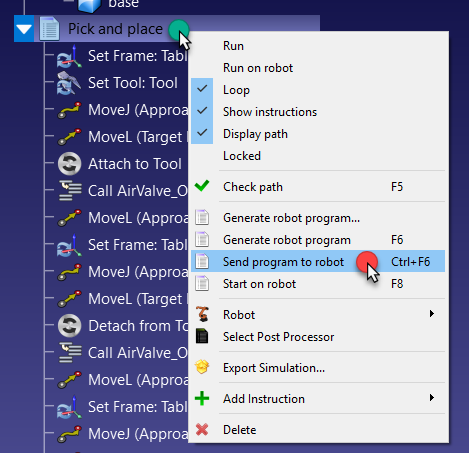 Robot drivers allow you to run a simulation directly on the robot (Online Programming). More information available in the Robot Drivers section. 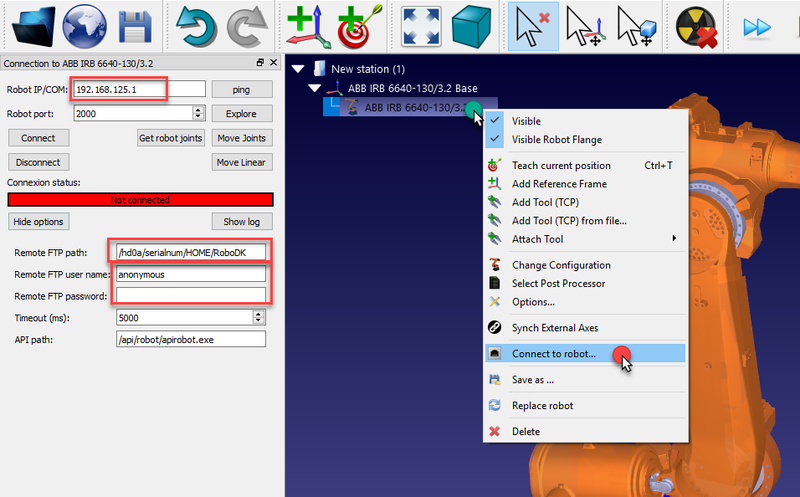 A connection between RoboDK and the ABB robot can be established to move the robot automatically from a connected PC using RoboDK. 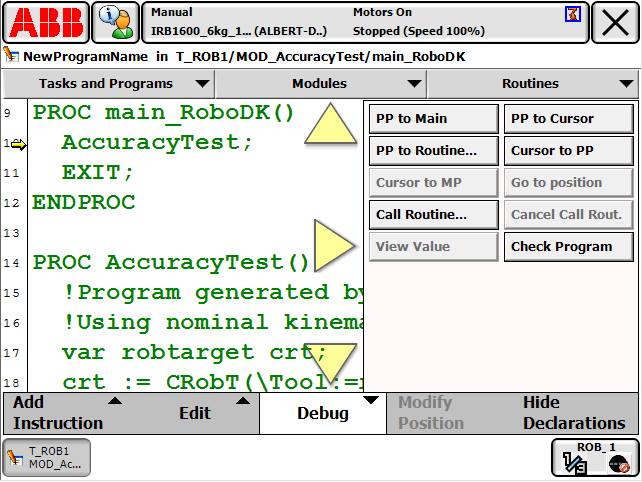 This allows using RoboDK’s Run on robot option for online programming and debugging. The connection can be established through an Ethernet connection (TCP/IP) or a Serial connection (RS232). 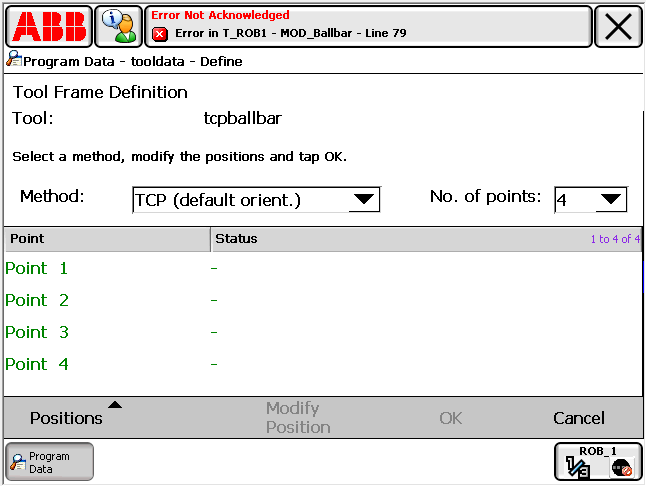 Important: This option requires the ABB software option PC Interface Socket Messaging if you use an Ethernet connection. 1. Connect the computer to the robot using an Ethernet cable (or RS232 connection if you are planning to use serial connection). 2. Load the RDK_DriverSocket.mod module to the robot (using a USB drive, FTP transfer or RobotStudio). It should be used as the main task and this module already contains the Main program call. Alternatively, use the RDK_DriverSerial.mod module if you prefer using the RS232 connection. e. Select the mod file, then select OK.
3. Run the Main program (you will find the Main program in RoboDK_Driver.mod). The default communication port for the provided program is 2000 but it can also be changed.